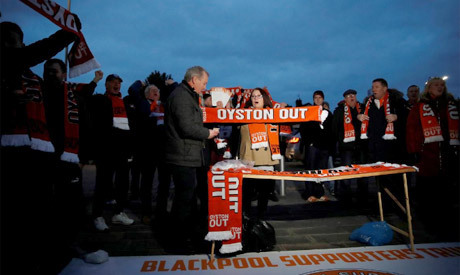 Arsenal's team bus was briefly delayed on the way to their 3-0 FA Cup third round win at Blackpool on Saturday after a home fan climbed onto its roof in protest at the Lancashire seaside club's owners. The fan was photographed sitting on top of the coach at Arsenal's team hotel shortly before the London side were to depart for the 1730 GMT kickoff at Bloomfield Road. Lancashire Police told the BBC that the protest lasted about 40 minutes before the man was persuaded to come down and was arrested "on suspicion of an offence under the Trade Union Act". The Arsenal team arrived in good time for kickoff and fears of more protests proved unfounded as the London club cruised to victory with teenager Joe Willock scoring twice and Alex Iwobi once. His day could have been even better but a linesman's flag ruled out a hat-trick goal. "It's a brilliant day for me on a personal note but I'm proud of how we did as a team as well. I don't think the scoreline reflects how well we played," he said.